Torque Rocker Studs: 40-45 ft-lb. Race Ready, Right Out Of The Box! 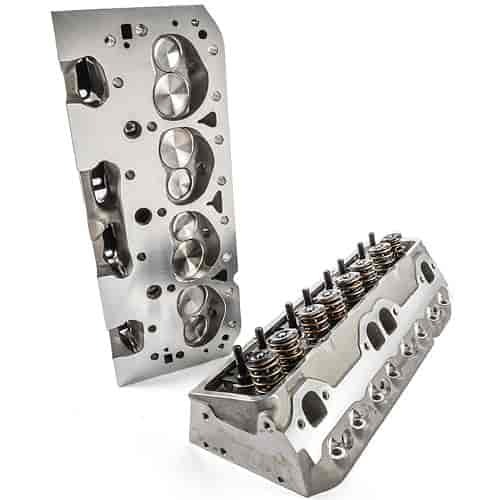 Brodix offers the Track 1 Series Small Block Chevy Aluminum Cylinder Heads in a variety of configurations that are ready to bolt-on and Dominate! The Track 1 cylinder head has a 221cc intake port and a 64 or 67cc combustion chamber. This head was designed for the drag or oval track racer who wants a lighter weight cylinder head that can make a significant difference in horsepower. The Track 1X head was designed as the next step above the Track 1. An additional 20 to 25 horsepower may be gained with this head out of the box over the traditional Track 1. Brodix has incorporated improvements such as a 40/60 valve spacing, CNC machined combustion chambers, 2.100'' intake valves, and new intake and exhaust ports. The 222cc intake port flows over 285 cfm at 700'' lift. The exhaust port flows over 195 cfm at 700'' lift. (*Track 1X requires a T&D Economy or Jesel shaft system.) The Track 1 STS Series heads are completely CNC-ported at an economical price. CNC porting ensures maximum consistency between each intake and exhaust port. The Track 1 STS Series head is available in four intake port volumes. Exhaust ports accommodate a standard Chevy pattern only. The industry standard has been taken to the next level with modernized CNC porting. Other features include a thick deck surface that is compatible with nitrous, drilled and tapped holes on the ends for standard drive accessories, phosphorous bronze valve guides and hardened valve seats installed for unleaded fuel. Sold in Pairs. ! Spring Pressure Open: 400 lbs. Spring Pressure Closed: 140 lbs. Spring Pressure Open: 550 lbs. Spring Pressure Closed: 240 lbs. What compression should these heads have to perform on a sbc ? With a .630/.630 lift cam ? 12.51 - 13 ?? The higher the compression you can get without any interference the more horsepower the engine will make. These heads will perform well with a 10:1 compression ratio.